There are a lot of aspiring entrepreneurs out there. I speak to many of them on a regular basis. Thanks to outsourcing marketplaces like oDesk, the potential is limitless (assuming you’re not afraid of hard work). As part of my ongoing partnership with SamaUSA, I participated in the following webinar. The goal of the webinar was to help young people learn how to get started (and become successful) by becoming online consultants. I hope you find it useful. Want more tips like these? Subscribe to our free eNewsletter. Professor: This is Matt Keener, author of Executive in Sweatpants. He is a seasoned freelancer, and he is going to talk to us about how to become a successful freelancer, and then we will open it up to questions. So let’s give Matt a warm welcome. Matt: I am going to start off with my background and then go from there. Is that ok? Matt: I graduated from college in 2005, and I went to work for a relatively big corporation (publicly traded organization in my hometown). I learned a lot of good stuff working for a big company, but I have always had this entrepreneurial drive I guess you would say. Interestingly enough, the company I was working for started a business unit that was focused on deploying and launching new business units. I thought that was an interesting idea, and so I actually switched from the marketing department to this new department. Through a series of changes, the department I was working for got spun off into a freestanding business. So I was plunged from the security of the corporate world into that of an unstable startup business. The startup was in a very traditional business model, where we were essentially trying to develop new technologies, incubate them, and then land big contracts. The cash flow was very unpredictable in that startup environment. My family was starting to grow. My wife and I had been married a few years, and we were expecting our first child. I thought the startup was great, but the cash flow was so unpredictable. I quickly realized that I needed to get down to business and improve my family’s cash flow stream. I started looking around to see if I could do some extra work on the side. Maybe there were some companies locally that offered part-time work. After searching, I couldn’t really find anything. Then, I started looking around on the Internet. I have always been interested in online commerce. I have had an eBay store since I was a teenager. I stumbled across oDesk.com and I was like, “Wow, this is really interesting! Is this for real? Do people really hire people to work from home?” I have always heard of the guy that lives in the other neighborhood that works for IBM, and he works from home. But other than that, I didn’t know it was really possible to start a home-based business that was actually legitimate. I looked around on oDesk’s website and quickly realized that if you filter out some of the craziness that is on oDesk, you can really get to some awesome job opportunities. I created a profile and started applying for a few jobs that looked interesting to me. (This was probably five or six years ago now.) I created my profile and started applying for a few jobs, and I got my first interview. I talked to the client. They were looking for someone with marketing experience that could help them manage various projects. They were looking to hire someone on an ongoing basis a few hours a week, and I was the perfect fit for their needs. It’s interesting because this client is still a client of mine to this day. It is so neat to think that prior to me creating this profile on oDesk, I would have never met this person. Now he is my longest standing client online. I do it from my home office. I don’t have to travel anywhere. Whenever I log onto oDesk, I am working, and then I am done. I don’t have to stand around and make chit chat with people. It is just so efficient! I realized that if I could dedicate myself to being a full-time consultant, I could make a whole heck of a lot more money than I used to make in the corporate world. At a certain point, I decided to make a career choice, and I decided to leave the startup world. I went straight into focusing on building my own online consulting business. As I said, now many years later, I am as busy as I have ever been. Today, I still have some oDesk clients. Other clients I’ve met locally or via other sources. Honestly, I have had to hire people to help me keep up with demand. I am just so excited to tell you guys about it. I hope that through some hard work and persistence that you can be in a similar situation in the the near future. Professor: Thanks Matt! I have a bunch of questions. But I want to open up to you guys. What questions do you have for Matt? In particular, how did you get here? I think that is my question. I don’t know about you guys, but what you said is that you just applied for a couple of jobs. Could you talk a little bit about your initial experiences as a new freelancer on oDesk? How did you target these long-term clients? 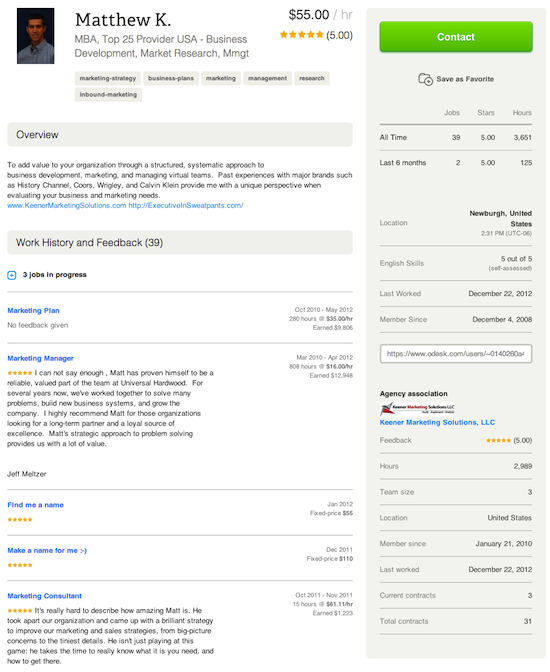 How did you sell someone on your first job having never had a job on oDesk? Matt: Well that is a very good question. You are really at a disadvantage as a new freelancer because you don’t have any feedback. A lot of clients won’t hire you unless you do have oDesk feedback. I knew that going into it. Having sold a lot of stuff on eBay, I knew that the feedback score in general was important. I really focused in on making my profile very robust. I also created some interesting content that I thought would appeal to prospective clients. I made a decision at that point to not try to be all things to all people. At the time, I was thinking if I can get anything that would be great. Just take a chance and be completely honest with prospective clients. I position myself as a mid to high level marketing consultant, and I have business experience. I have had to help build websites in the past and lead different projects. So, I built out the profile section quite a bit, and then also I decided how I was going to position myself on oDesk. With oDesk, you can take some qualification tests. At first I picked some that didn’t relate to what I was doing and realized that this was a waste of time. Why do do clients need to know that I am a Microsoft Word expert? Nobody cares. So I took a marketing strategy test and a few others that related to marketing strategy. This seemed to pay off quickly. Then, on top of that, I went through and did some online certification testing. I think oDesk formerly (I don’t know if they do anymore) had a relationship with Brainbench, an online certification program where you could take some free certification tests. So, I became a Brainbench certified project manager. I still have the certificate here somewhere in my office that I printed off. With the certification and my robust profile, I had a lot of things to talk about with prospective clients. The conversation wasn’t so focused on the fact that I didn’t have any feedback. I could talk about my past work experience and how I have scored well on relevant tests. Therefore, if you lack feedback, you need to compensate by using all of the other tools that oDesk gives you. You then need to be really persistent at seeking out prospective clients. Professor: So what were the certificates you got? Matt: I think Brainbench makes a certain number of their certification tests available for free to anybody, and then you can also pay for certain certifications. I happened to notice the free “project management” certification, and I felt like that would help me tell my story better. Professor: Awesome! When you say you made your profile really robust, could you talk to us a little bit about the specifics of what you did to make it that way? Matt: Within your profile, you can pick some areas of specialization, and so I picked out the ones related to how I was positioning myself: marketing strategy, SEO, SEM, content writing – things like that. I went through and looked at all the categories and tried to pick the ones that most closely identified my differentiators. I think a lot of people who hire on oDesk are probably small to mid-sized companies, and in many cases you are working with an entrepreneur who is making the hiring decision. They are making rapid decisions. So, if they spot something that is a red flag, they might toss you out quickly. I had my father, who is a photographer, come and take a professional looking photograph of me in front of a nice looking backdrop. I smiled; I didn’t look like I was scared to be there. The reason I laugh is because I see a lot of profiles, which are just hilarious to look at because people look surprised they are getting their pictures taken. The first thing prospective customers look at is your photo, so make sure it’s professional looking. I also spent time building out my oDesk profile description. If you have grammatical errors or you claim to be an expert at everything, people are going to have suspicions. I tried really hard to focus on my content and how I could tell a story in a few sentences. I didn’t try to write everything. Also, the oDesk portfolio section is important, even though I hadn’t done any online work yet. I had done quite a lot of work for the startup and former employers. I had some things that were not under nondisclosure that I was able to add to my portfolio. For example, I had written an article that was featured in a publication, so I linked to that from the portfolio. Student: What would you say are key factors for becoming a successful freelancer and also maintaining that status on oDesk? Matt: I think that a lot of people unfortunately don’t get off on the right foot. (By the way, I just say oDesk as a preference. You could use Elance, and there are a few others. I have just always done oDesk because I have found success with it, so I didn’t feel I needed to set up a profile on Elance. I know a lot of freelancers do set up mirroring profiles. That’s just the decision I made.) Anyway, one key thing is to avoid being frustrated by all the jobs that are $3.00 per hour. When you are first getting started, you may have to take a few jobs that are under what you think you are worth potentially on an hourly basis. For example, when I got started, I was working on my MBA. I had a college degree. I had corporate experience. I could have at least “expected” $20.00 or $30.00 an hour. Instead, I just set my public oDesk profile at $11.00 an hour (because at the time I just wanted to get some experience and get a client). I undervalued myself. I had a lower hourly rate. I had a really good looking profile, and so it got attention. If you have marketable skills but a lower hourly rate, you are going to show up in more filters, and you can start to get clients by undervaluing yourself. Over time, clients began to pay me more per hour. They see the value I can bring to them, and I continuously show them that I am loyal. They continue to improve my compensation to retain me instead of letting me go to another prospective client for those hours. Let’s say your goal is to get two clients and five hours a week for each client. Ten hours would be a good goal. Focus on making those clients really, really happy. Then add more clients and continuously increase your hourly rate as you get more clients. Each new client might pay a little more per hour because they are newer, and you have proven yourself on oDesk. How Long Should I Undervalue Myself? Student: How long did you undervalue yourself before you were confident enough to ask for more money both from the clients you had already been working for and from new clients? Matt: Early on in my online career, I only probably had five or ten hours a week that I could dedicate to a part-time job. Remember, I was working 50 to 60 hours a week already on my startup business. So I was like, “Hey, I am working five hours a week for this one client. That’s getting me what I need in order for me to feel good about being a provider for my family. I am just going to go ahead and increase my public hourly rate maybe 20 or 30 percent. So, if anybody wants to hire me at a higher hourly rate, then I’ll talk to them, and I’ll make time somehow for that additional client. It just kind of worked out that way. It’s like supply and demand. I have a certain amount of supply and a certain amount of demand. As my supply decreases, my value goes up because that’s what it would take to have that conversation. Student: I have over 25 years of office management experience, but I haven’t worked in a couple years for disability reasons. I was just wanting to know as far as starting up, how do you know how many jobs to accept? I always tend to over do it for myself, and there are a lot of jobs out there that I would qualify for, but I don’t want to do too many at a time. How do you know how much to start with? Matt: Initially, I took on too much. I was working seven days a week to keep up. Like I said, my wife just had a baby. I was working on Sundays. I know you are not supposed to do that, but I had to in order to keep people happy. So, I had to make a decision at that point, and I said, “Realistically how many hours a week do I want to work? What’s the maximum I would be willing to work?” I then set a limit for myself. I have been extremely cautious to take on more than I can do. I like to under promise and over achieve! I don’t have a magic number for you, but if you get one or two clients, you could keep them pretty happy and then add to it as you go. I would say from a prospecting standpoint, I can give you a few example statistics. When I was applying for jobs on oDesk, I would filter out jobs based on hourly rate or budget and focus on jobs that were in my skillset like marketing strategy. If I wanted to get one client, I would apply for about ten jobs. To stand out from the crowd, I would write custom cover letters (based on a template I created), but I would customize it to make it sound like I really understood their business model. If I did ten of those, I would get two or three interviews, and then I would maybe win one or two jobs. So it depends on if you are going to position yourself mostly on an hourly basis or package your services up on a fixed-price basis. I have done both of those. It’s a little bit harder to know on a fixed price job how much time to budget. I could see where an hourly situation would be more advantageous because you could tell the client, “Currently, I have between five and ten hours a week that I could dedicate to your project.” By letting them know up front that that’s your availability, then it’s OK for them to say, “That’s great. I need more hours. I will come to you first, and if you can’t do it all, then we will go hire a second administrative person. Then you guys can work together, right?” Knowing your limitations in advance can be extremely helpful. Student: You said that you set your hourly rate low and then made it higher. If you’re working for the same client and all of a sudden your rate is higher, how do you do that? Do you let them know or do you just post it on oDesk that all of a sudden your hourly rate is different? Matt: The way that oDesk works, for example, you have what’s called a public hourly rate. That’s just some number that you pick out of the air. Back in the day, my profile would have shown $11.00/hour. Now its much higher. It’s kind of what you’re saying you generally expect to get from the market. This is of course negotiable because when you interview for a job, they could see your hourly rate is $11.00/hour and ask if you would work for $8.00/hour. Some clients just say, “I’ll go ahead and hire you at your hourly rate.” Once that contract is locked in, you can’t really get out of that rate with that particular client (unless you can convince them otherwise). So for example, I got that first client at $11.00/hour but then increased my public profile to $15.00/hour, so that the next person that comes in says, “Well this is Matt. He says his public hourly rate is $15.00/hour. I see that he has one client that hired him at $11.00/hour, so maybe there’s a little wiggle room there.” Some clients don’t bother to look at previous contracted rates. In my case, that’s what happened a lot. I think that if you can communicate well and sell yourself, then your hourly rate is relative to your value. If you bring more value to clients than what they’re paying you, they are always going to be happy. Student: I know we are talking about all the positive things, but can we talk about the negative things – some of the roadblocks with oDesk as well as some of the bad clients? What are some of the things we should look out for and how did you overcome those situations? What did you see that was kind of tricky when it came to dealing with certain clients? Matt: If you don’t have a lot of feedback and you take on a client who is going to be dishonest (or maybe has unrealistic expectations), then you could suffer for it. I’ve always been obsessive compulsive about my feedback score on oDesk. I’ve had two clients that were negative experiences, I guess you would say. Shortly after I got started, I was browsing fixed priced jobs, and one of them was a $50 project that was to rewrite an email. Simple enough, or so I thought. So I rewrote it, and it took me thirty minutes. I sent it back to the client and said, “Here you go.” I was thinking, “OK $50.00 – so realistically my hourly rate on this was $100.00/hour. Wow! That’s great!” Well, of course, they sent it back with all kinds of negative markings, and they called me and said, “Hey you didn’t do this right. We wanted you to create a graphical brochure out of this.” I told them, “That’s not what we talked about. You just asked me to rewrite it, and I think it is pretty good.” They had expanded the scope of the project – without increasing the budget. Anyway, I went through this and spent hours on it. To make matters worse, they ended up giving me a less-than-five star feedback. It was just a kick in the gut. So I would say that one lesson I learned on that project was to avoid low-paying fixed priced jobs, I mean honestly, even if you get a feedback that is good, it is not going to be that valuable to you because it is only a $50 job. I’d say it’s better than nothing, but it’s a big land mine waiting for you to step on it. I would steer clear of those types of things. The other experience that I would say was somewhat negative was when I took on a client that was paying me a lot more that $10.00/hour. This was one of my earliest higher paying clients, close to what I am making now. When I was interviewing with them, they were telling me about their software that they were developing. I didn’t ask the right questions I guess, because when I got into the contract, what they were doing–it wasn’t illegal or unethical per se, but it just seemed like it was a gray area. So, after understanding what they were doing I said, “I appreciate you offering me the job, and I hate to do this, but I am going to have to back out of this contract because I feel it isn’t aligned with my personal morals.” Surprisingly, they understood. They agreed that it wasn’t exactly clear how their software would work out. So anyway, we agreed and they didn’t leave me a bad feedback. You are a reflection of who your clients are, and if you don’t agree with what they’re doing, then you need to reconsider the situation. You need to ask the right questions, especially after you have established yourself. Ask the right questions to make sure they fit with your values. Student: I just wanted to thank you for being a good role model. I’m kind of taking baby steps, so I know I’m going to grow and find more jobs. Right now, I am very, very, new, and I have all these role models around me who know exactly what they want to do. I know professors advise me that I’m going to find my place in this, but you guys make it sound so easy, like it is just lickity split. Matt: It’s not easy. I’ve been doing it for years now. When I have these kind of calls, I don’t really prepare because it is just kind of ingrained in my existence now. But five years ago, I was sitting on the couch feeling like a bad father because I wasn’t providing enough for my family, and I was spending time potentially on a business that wasn’t going to pan out. I’ve been there. My wife is a teacher. Teachers don’t make a ton of money. We lived off her income for over a year. It took me several months (potentially a year) to really get into my groove. It’s just one of those things. If you feel like you have a skill that other people might benefit from, then you can market yourself online. I think there’s a lot less risk involved with having ten clients online. Your risk from your own personal risk factor is a lot less that having one job down at the factory or down at the corporate office. If there is a downturn in the economy and the company cuts back or they offshore their production to Mexico, then you are stuck with finding a new job. I feel very blessed to have ten clients that I work for every day because if one went out of business, God forbid, I would just go and replace that 10% of my hours. I think that you are on the right track, don’t lose faith, and stay dedicated to it because it will work. Student: What do you find are the most productive ways to set your hourly schedule? Do you set specific times every day? Do you do it when you have time, on weekends, Sunday mornings like you were saying? Matt: That’s a very good question. I struggled with that as my family went from my wife and me to my wife and me plus a child. Last year, it became my wife and me plus a child and another child. It’s constantly evolving, and you don’t have that buffer zone driving from your job back to your home to decompress. So, it is very important that you are intentional with scheduling your time. For me, what works is waking up and exercising. I spend a little time with the kids, and then I’m working by 7:00 or 7:15 a.m. Then my family knows from that time until about 5:30 p.m. are work hours. Now, I will take a break for lunch and eat with the family. My wife stays at home with the kids now. She does a great job of making sure that the kids are not coming in here and distracting me during my office hours. For me, I do everything in my power to schedule things. I have some spreadsheets on my website that you guys might like to check out. I use a weekly planning spreadsheet where I’ll sit down at the beginning of the week and plan out every day down to the minute. I tend to work about 530 minutes per day for clients, and then I will work an hour or so on my own stuff – whether that’s accounting or blogging, etc. So I work about a ten hour day. I choose to do that because I don’t want to turn down good opportunities. Then I slice up that weekly plan into my daily plan (I use a spiral notebook), and I just check hours off as I go. The reason why I created the spreadsheet is because it kept me motivated to get more clients. If I work this many hours at all these different rates then it’s going to yield this amount in consulting fees. By doing a weekly plan, I can see how fluctuations in my work hours will impact my weekly revenue. It’s important to plan and to set boundaries and have expectations. On the weekend, I have one client that I have a Saturday morning meeting with. I used to work Saturdays from 7:00 a.m. to noon. When we had two kids, I decided I could no longer do this. I need to have more family time. I found a way by hiring a few people to do some administrative work for me. I just said that’s an investment in my personal life. I don’t work on Sundays, but I have in the past. It might be effective in making your clients happy, but you are not going to deliver quality work in the long run. Professor: Matt, if this a weird question, forgive me. Do you feel that you’re making more money doing it this way than you would at a traditional job? Matt: Yes, I certainly am. I didn’t use to, when I first got started. But by pushing myself and setting goals and extending my hour capacity, I’ve done just that. If you feel forty hours is all you can handle with your family and balancing stuff, that’s great. It’s a decision you’ve made. If I worked at a corporate job, I would only get paid for forty hours. So I’ve done that by steadily increasing my hourly rate and also pushing myself to work as much as I can without burning myself out. Let’s say you’re a marketing person, let’s say you’re an accountant, let’s say you’re an administrative assistant – there’s nothing stopping you from being a sales representative, too. You can find software, technologies, services that you could recommend to your clients, all of whom have different needs. A lot of software applications will have referral agreements where you can get a commission for referring software or services to your clients. For example, educating freelancers is something that I’m passionate about, but I’ve got to figure out how to monetize it. On my website, I have all kinds of software that is useful to companies that outsource and work online. So kind of be aware and listen to what your clients needs are and think if you can fill that need somehow – then get a commission back from the service you are referring. That will help free up more time, too. Student: If you’re a beginner, how do you know the number of hours you need to spend on the client’s project. I think the answer to your question is to ask a lot of questions and then explain why it’s going to be better to invest a little bit more to get a better product. Professor: Matt, I have just one last question today. We are going to be working on proposals. What tips do you have for writing a really great proposal? I mean cover letter? Matt: You’re trying to get their attention, so they will interview you, right? That’s a good question and there are a lot of different theories on this. I would say first and foremost, you want to do some research if you can. Some clients won’t reveal any information. A lot of them will. They will say this is our website, this is what we do. I would make sure you personalize the message. “Hey Matt.” “Hey John.” Then I would do a little digging into their company. I would try to understand what it is that they do, who are their clients, and why did they take the time to post this job and find somebody like me to add value to their company? What I would do then, I would say, “I’ve reviewed your job posted on oDesk. I’ve also looked into your company and think you have an interesting business model. I’ve got some experience in that industry and here’s how. I would love to chat with you.” I think you should keep it brief and make it personal enough to where it catches their attention. Whenever someone sends me a cover letter titled “Dear Hiring Manager,” I can almost guarantee that I’m not going to waste the time to talk to them because I’m looking for somebody who is a little bit more entrepreneurial. With websites and social media and everything else, it doesn’t take much effort to go out and try to learn something about a company. Personalize it and personalize the message to what you perceive their needs are. Give them as many ways to contact with you as possible. Just be ready for their call. Also if you can’t answer their call, make sure your voicemail sounds professional. It just doesn’t go to, “The cellular customer you’ve reached is not available.” Tie the whole package together and really make it to where it’s a crazy decision for them to not want to hire you!